Fleetwood Mac's split with Lindsey Buckingham marked one of the biggest breakups of 2018. But if the iconic rock band's longtime guitarist and vocalist was missed Thursday night at American Airlines Center in Dallas, it wasn't obvious. Fans packed the venue, floor to rafters, for a two-hour journey through a collection of Fleetwood Mac's greatest hits. Throughout the show, the group proved to be an indomitable and engaging force, despite missing one of its core members. Guitarist Mike Campbell (Tom Petty's Heartbreakers) and vocalist Neil Finn (Crowded House) joined singer Stevie Nicks, keyboardist Christine McVie, drummer Mick Fleetwood and guitar player John McVie, expertly filling in the musical spaces left behind by Buckingham, who is said to have left over creative differences. Only once did any of the members seem to acknowledge their former bandmate, though they stopped short of mentioning of him by name. 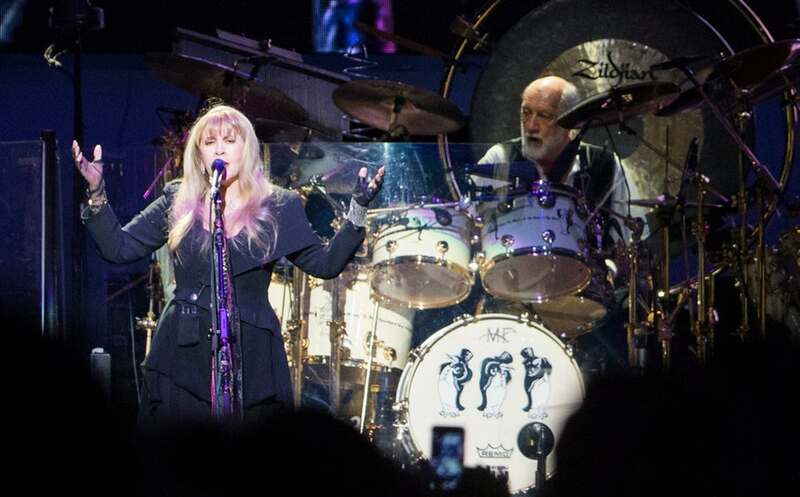 "What a crazy, magical ride it is, this band Fleetwood Mac," said namesake drummer Fleetwood about halfway through Thursday's set, addressing the crowd before turning to Campbell and Finn. "We're absolutely overjoyed to welcome you to the band." For more than five decades, Fleetwood Mac has been a musical tastemaker thanks in no small part to a catalog that resonates across generations and the mystique of leading lady Nicks, whose fashion style was emulated by fans dressed in flowing dresses and felt hats. The band didn't miss a beat as it powered through classics like "Little Lies" and "Rhiannon," as well as deeper cuts, including "Oh Well" and "Tell Me All the Things You Do" from its earliest era. The band loaded the beginning of the performance with favorites like "The Chain," "Dreams" and "Say You Love Me," exposing some of the limitations in the tenured singers' vocal ranges, though they thrived consistently as a harmony section. By mid-set, however, Christine McVie, Nicks and Finn had warmed up and their notes rang out with renewed energy with a little help from adoring fans who knew every lyric. Nicks' take on "Black Magic Woman," which she refreshed to be from a woman's point of view, was especially sultry, and she left the audience hanging on every word of a chill-inducing rendition of "Landslide," performed with only Finn by her side on guitar. Nicks even offered a couple of her signature twirls following "Gypsy," as if to show the audience she's still got it. Much of Fleetwood's Mac show was an effort to give longtime fans exactly what they wanted by laying down hit after hit. There were a few surprises, though. "World Turning" transformed into a 10-minute epic after Fleetwood and percussionist Taku Hirano took the audience on a winding musical journey bolstered by hand drums, chanting and trippy visuals. And Finn delighted fans with a cover of Crowded House's beloved sing-along "Don't Dream It's Over." One moment that didn't work was the very last of the show. After a riveting encore, featuring a tribute to the late Tom Petty to the tune of "Free Fallin'" and smash-hit "Don't Stop," the group's female power-duo stepped up to the mic for a duet of ballad "All Over Again." It was a statement to be sure, but ended the concert on a sleepy and confusing note, as crowds waited to see if it truly marked curtain call. The joyous energy in the venue came to a screeching halt. Though that was, in fact, the last Dallas would see of Fleetwood Mac, the anticlimactic ending didn't leave a lasting impression. For fans old and young, the concert was the band's best vinyl records brought to life. Two hours and 22 songs later, Dallasites were satisfied to grab their jackets and go their own way into the wintry night.